Do the Minnesota Vikings have the NFL's best WR duo? The Minnesota Vikings have passed the point where their receivers can simply be seen as an underrated group – it’s time to recognize the league’s best wide receiver pairing: Stefon Diggs and Adam Thielen. Even just in raw box-score numbers they look impressive. Thielen is third in the league with 793 receiving yards while Diggs, despite missing some time, is 22nd (500). 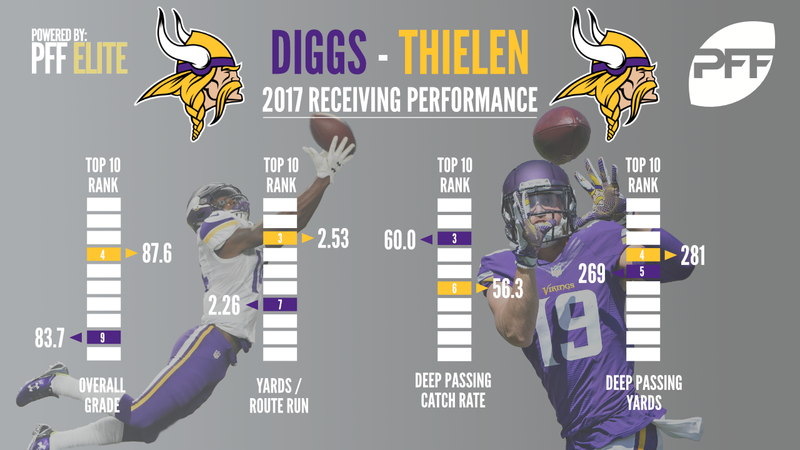 In overall PFF grade, they currently rank fourth (Thielen, 87.6) and ninth (Diggs, 83.7) – the only team with two receivers in the top 10. What’s remarkable is that they have achieved these results and that production with a backup quarterback throwing them the ball for most of the season, and a completely ineffective Sam Bradford for half a game when the Vikings made his ill-advised comeback attempt before he was shut down for the season. Case Keenum has played well this year given his previous career baseline – no doubt aided by this receiver duo – but isn’t raising the play of his receivers in a way a true stud quarterback could. He ranks 18th in the league with an overall PFF grade of 78.0. However you divide up the credit between that group, it is clear that Diggs and Thielen are pulling Keenum up more than Keenum is helping them to flourish, i.e. they could be even better. The Vikings have unusually developed a pair of receivers who both buck the physical trend for their roles within the offense. Thielen may have developed into the best slot receiver in the game. While the rest of the league has been working on Wes Welker clones, the Vikings found a 6-foot-2, 200-pound receiver that can provide a threat vertically from the slot as well as work the middle and run after the catch. Thielen has 2.24 yards per route run this season from the slot, the second-most in the NFL trailing only Pittsburgh’s JuJu Smith-Schuster, who has just a fraction over half the receptions Thielen has when lined up inside. 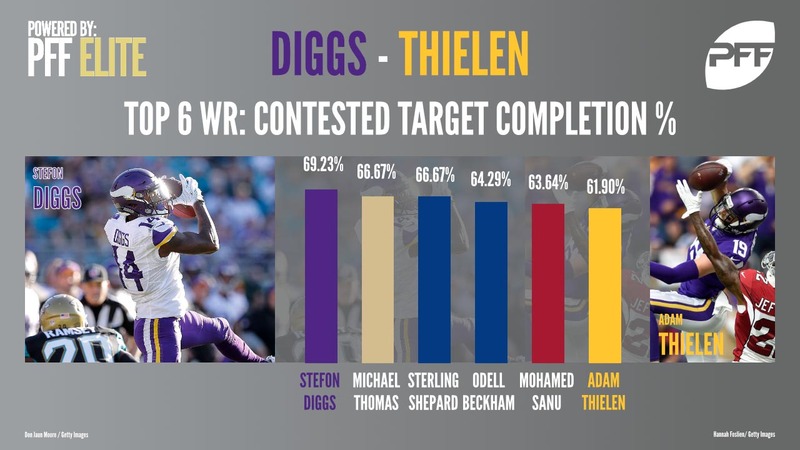 While Thielen is much bigger and stronger than your typical NFL slot receiver, Diggs is much smaller and more slight than your typical No. 1 receiver. At 6-foot-3 and around 220-pounds, Julio Jones is the prototype body shape for that spot, but Diggs is a couple of inches shorter and around 30 pounds lighter. He has become an elite receiver in the mold of Antonio Brown, who somehow plays far bigger than his frame would normally allow. That shows up in the advanced numbers as well as just anecdotally from watching his tape. He has multiple plays this season where he has taken the ball away from a defensive back at the catch point or been able to snare the pass and ride a big hit to hold on and complete the catch. Diggs in fact leads the league in contested catch rate at 69.2 percent, significantly higher than anyone else. Diggs and Thielen are both among the top six in contested catch rate, illustrating how they have been able to make Keenum look a little better than his play has deserved. The Vikings may have a potential quarterback dilemma looming over them as they head into the second half of the season, but they do at least have weaponry for whoever that quarterback ends up being to deploy. The duo racked up 244 yards from 12 receptions yesterday against Washington, and could have had far more had Keenum not attempted a minor meltdown late in the game in committing turnovers. Minnesota’s receivers don’t just deserve a little more recognition, and aren’t simply an underrated pairing anymore. The Vikings have the league’s best WR duo in 2017, and neither of the two were drafted before the fifth round.